This set includes 3 digi's . 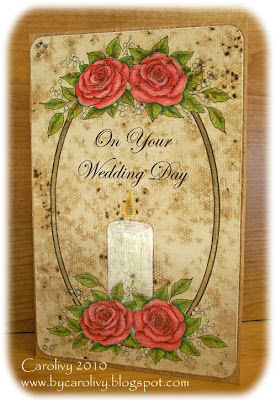 The Rose Spray with Candle is perfect for a Wedding unity candle. The Roses Spray images are meant to be used on the bottom or top of a frame. 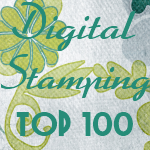 There are ready-to-print sheets as well as the individual digi's ( in JPG and tranparent PNG) (300 ppi). Here is an example created by DT Carol Lepard. 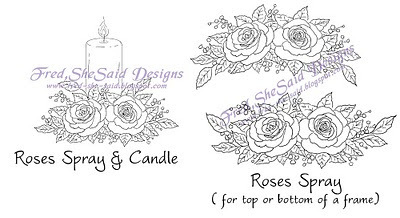 She used the Roses Spray with Candle and the Rose Spray for Top of Frame ( she assembled in a graphics program with an oval frame and text but you can easily do this by colouring and cutting each image and attaching to eg. an oval die cut frame). She used walnut crystals background and coloured the images with pencils/OMS as well as various shimmery paints.